Summer is just around the corner, and we are ready to soak up the Virginia Beach sun! When those warm days come rolling in, it’s only natural to start planning picnics in the park and afternoons sipping a beer on a patio. One of the best parts of these beers is the seasonal ales that our favorite breweries release! Not only do they taste great, but that flavor seems to be extra special since we know it won’t be available again when the weather cools for autumn. If you’ve ever wondered what makes a seasonal summer ale, read on to learn more. Refrigeration is a fairly new invention when we compare it to the beer-making practices of old. Before refrigerators were readily available, breweries just had to make do with the ingredients that were available while they were brewing. This meant that if a fruit or ingredient was out of season, it just couldn’t be used. However, the fresh hops and barley that was in abundance during autumn made great darker, stronger beers. Of course, once the springtime came, these ingredients were harder to find – meaning that the beers became less stout and much lighter. The first identified “summer beer” popped up in 1984 from Anchor Brewing, and breweries all over the world have been embracing the title ever since. However, there has technically never been an exact definition of a summer beer. It is sort of taken on a category of its own! The website, BeerAdvocate.com, lists about 1150 beers with “summer” in the name of the beer. However, summer beers is not a category. Most of the beers labeled with the word “summer” are categorized under American Pale Wheat Ale. Summer ales are usually light and crisp in their flavor. This does not mean that they taste watered down – in fact, you will find that the best summer ales are filled with flavor! The wheat seems to be the key ingredient in these beers. When craft breweries combine barley and wheat together, it creates a delicious blend of light flavor that you won’t be able to get enough of. The combination of the barley and the wheat creates a balance: barley is almost free of gluten, but wheat is filled with gluten. In our summer ales, we love this contrast! Who had the bright idea to mix in the wheat with barley during the brewing process? It was actually master brewers in Germany who felt inspired to combine the two. These brewers knew that they couldn’t just use wheat – it would have made a mess, and the brewing equipment back then would not be able to handle it. However, they quickly found that mixing in barley worked wonderfully during the summer months. Now, wheat beer is a major part of German beer. Any beers with “weiss” or “weizen” in the name means that they used wheat grain to brew this particular type. Chances are good that your favorite summer ale has a lot in common with German beer! A major part of the craft beer movement is adding interesting and complex ingredients to the beer to create a new flavor. With this in mind, you might find ales with hints of citrus, caramel, or other flavors the brewer found to be intriguing. Even the ingredients that sound a little different to you may make the beer taste delicious, so don’t be too afraid by the flavors the beer lists. Even though the flavors in these beers vary from brew to brew, all summer ales seem to have one thing in common: they lack complexity. This is not a bad thing, as summer is about enjoying the lighter things in life. 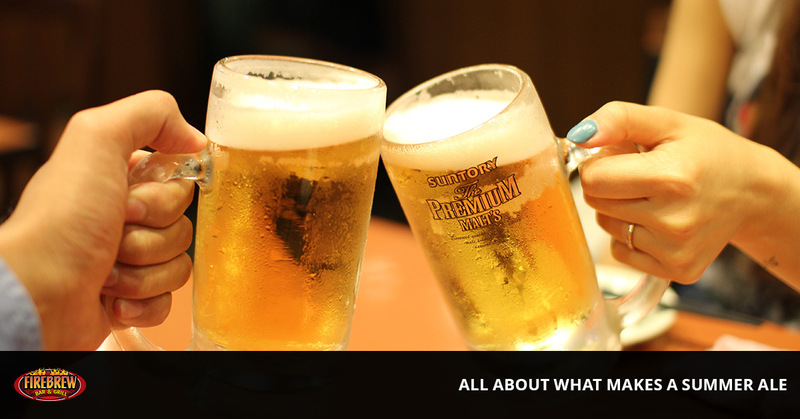 We guarantee that a summer ale will be everything you need to keep your thirst quenched and your taste buds delighted. If you are looking for your new favorite seasonal summer ale, then it’s time to come see us! FIREBREW Bar & Grill has the happy hour specials, drinks, and meals to make your visit unforgettable every time. Bring the family for a relaxing summer night or make it a date night with your loved one. We will see you soon!